A majority of aging services are federally funded through the 1965 Older Americans Act. This law requires that planning and service districts be designated to plan and implement aging services. The Lieutenant Governor’s Office on Aging has divided the state into ten planning and service districts. Central Midlands Council of Governments was designated as the midlands’ Area Agency on Aging in 1976. The mission of the Area Agency on Aging is to plan programs and services for the growing population of older people in Fairfield, Lexington, Newberry and Richland Counties. The agency subcontracts with local providers for delivery of services. The Regional Aging Advisory Committee, the majority of whom are older individuals or individuals who are eligible to participate in Older Americans Act programs, representatives of older persons and the general public, assists the Council of Governments in fulfilling the responsibilities of the Area Agency on Aging. The regional ombudsman receives calls and investigates complaints related to residents in long-term care facilities. Complaints range from abuse, neglect and exploitation to quality of care issues. To contact the Regional LTC Ombudsman please call (803) 376-5389 or toll free at 1-800-391-1185. For more information on the CMCOG Long Term Care Ombudsman Program, please click here. To learn more about our new Volunteer Ombudsman Program, please click here. The Older Americans Act requires that a multi-year comprehensive area plan be developed for the planning and service area and submitted to the Lieutenant Governor’s Office on Aging (our state unit on aging). The White House Conference on Aging reports, 1990 Census data, needs assessment surveys, service delivery waiting lists and current service levels are used to project the need for service. The Area Plan also requires that staff coordinate with other service organizations, engage in program development when needed, provide training and technical assistance to service providers and serve as the quality assurance component for contracted services. A public hearing is conducted and the Regional Aging Advisory Committee and CMCOG Board approves the final document. The area plan is updated annually each spring. The Area Plan can be viewed by clicking here. 1. Information: public education, and outreach regarding available support services. 2. Assistance: Provide assistance to individuals on how to gain access to services. 3. Counseling, Education & Training: Provide advice, guidance and instruction to caregivers on an individual basis to solve problems faced in their role as caregivers. 4. Respite: Helping caregivers find temporary relief from care-giving responsibilities on an occasional or emergency basis. 5. Supplemental Services: Provide compensation to assist with the cost of some services (e.g. home safety supplies, nutritional supplements, incontinence supplies) used in the provision of care to family members. 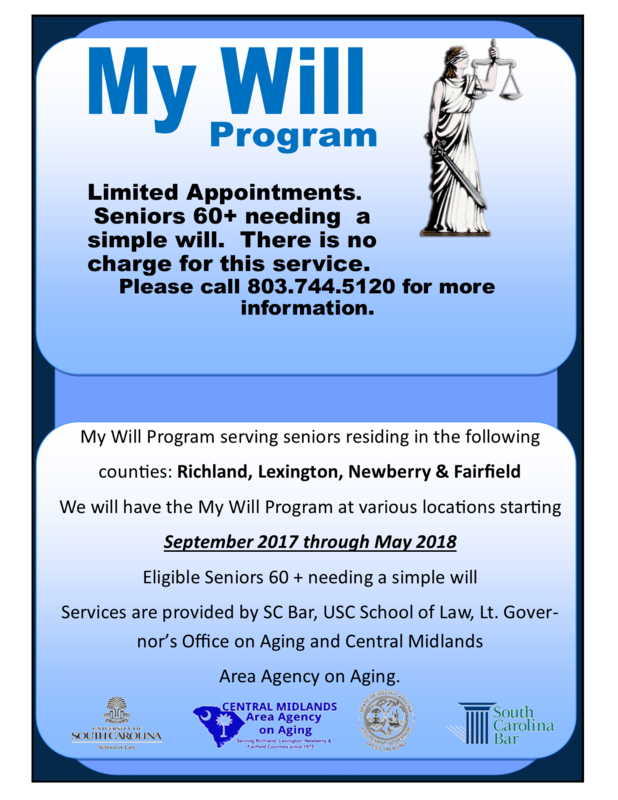 I-Care is a program provided by the Central Midlands Area Agency on Aging to seniors on a variety of issues such as insurance counseling, assistance and referral. Information is also available regarding the Medicare Program, the dangers of Medicare fraud, the Modernization Act of 2003 (Prescription Drugs Programs), Medigap information and Medicaid programs. 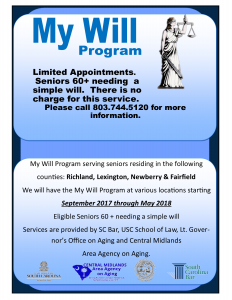 For more information on I-Care, contact Shelia Bell-Ford (803) 376-5390 Ext. 309, or JaJuana Davis (803) 376-5390 Ext. 312. The Area Agency on Aging Respite Programs are for those caregivers providing care at home for a loved one or family member. These respite programs can be used to hire someone to help assist the caregiver with his/her loved one’s care and provide much needed relief. Respite can be provided by an agency, facility or adult day care as well as an individual. Caregivers (age 55+) raising children with disabilities (this includes senior parents with adult children with disabilities). Caregivers (age 55+) raising children (e.g. grandparents or other relatives, not parents). Caregivers (age 55+) providing respite to a loved one in the home. Respite funding from two different respite sources will not be allowed. This includes Caregiver Support Program, Community Long Term Care, Hospice, Medicaid (PACE) program (for Alzheimer’s Respite and SC Respite), VA benefits providing in-home care, and SC Respite Coalition Vouchers. *Please note that the Alzheimer’s Association takes phone calls and applications, but the AAA issues the actual vouchers. Priority in awarding respite funds will be given to caregivers who provide direct care for their loved ones. Alzheimer’s caregivers will provide a doctor’s written diagnosis of Alzheimer’s or a related memory disorder disease. Respite monies are limited to 90 days from issue date and funds may be lost if voucher is unused. Providing that funding is available, respite vouchers are issued on a quarterly basis, with a sixty (60) day lapse from the last day of respite service provided by the respite voucher. When demand for services exceeds capacity, applicants are placed on a waiting list. To apply for respite care, please download and complete the Respite Application form by clicking the following link. New Respite Application FY 2017-18. For more information, please call (803) 376-5390 or visit the adrcmidlands.org website. To access our Benefits Checkup Rx Questionnaire, please click here.